Woods won The Players for the first time since 2001 and joined Fred Couples, Davis Love III and Steve Elkington as the only two-time winners at the TPC Sawgrass. Woods ended a weekend of testy words with Garcia by doing what he does best — closing out tournaments. Tiger Woods had the last word against Sergio Garcia by winning The Players Championship on Sunday. Woods ended a weekend of verbal sparring with Garcia by doing what he does best — closing out tournaments, even if he let this one turn into a tense duel over the final hour at the TPC Sawgrass. Tied with Garcia with two holes to play, Woods won by finding land on the last two holes for par to close with a 2-under 70. If only it were that simple for the Spaniard. Garcia was standing on the 17th tee shot, staring across the water to an island as Woods made his par. He took aim at the flag with his wedge and hung his head when he saw the ball splash down short of the green. Then, Garcia hit another one in the water on his way to a quadruple-bogey 7. He completed his stunning collapse by hitting his tee shot into the water on the 18th and making double bogey. Woods was in the scoring trailer when he watched on TV as Swedish rookie David Lingmerth missed a long birdie putt that would have forced a playoff. It raced by the cup, and Lingmerth three-putted for bogey. "How about that?" Woods said to his caddie, Joe LaCava as he gave him a hug. Woods won The Players for the first time since 2001 and joined Fred Couples, Davis Love III, Hal Sutton and Steve Elkington as the only two-time winners at the TPC Sawgrass. It was his 78th career win on the PGA Tour, four short of the record held by Sam Snead. Lingmerth closed with a 72 and finished two shots behind along with Kevin Streelman (67) and Jeff Maggert, who also was tied for the lead until finding the water on the 17th to make double bogey. The 49-year-old Maggert birdied the 18th for a 70. Garcia took 13 shots to cover the final two holes — 6-over par — and tumbled into a tie for eighth. Woods made this drama possible by hooking his tee shot into the water on the 14th hole and making a double bogey, dropping him into a four-way tie with Garcia, Maggert and Lingmerth. The final two holes came down to Garcia and Woods, most appropriate given their public sniping at each other this weekend. It started Saturday when Garcia complained in a TV interview that his shot from the par-5 second fairway was disrupted by cheers from the crowd around Woods, who was some 50 yards away in the trees and fired them up by taking a fairway metal out of his bag. He said Woods should have been paying attention, and it became a war of the words the next two days. 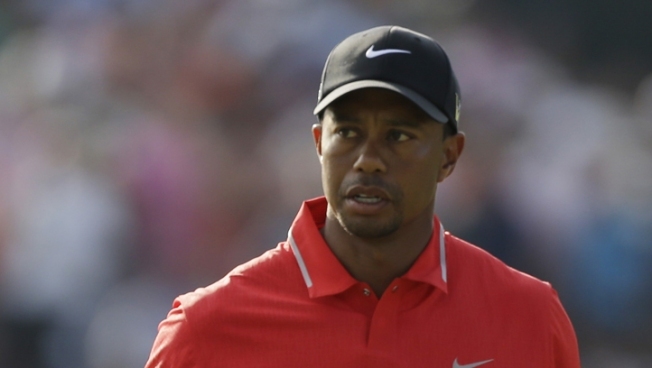 "Not real surprising that he's complaining about something," Woods said. "At least I'm true to myself," Garcia retorted. "I know what I'm doing, and he can do whatever he wants." When they finished the storm-delayed third round Sunday morning, Garcia kept at it, saying that Woods is "not the nicest guy on tour." Woods had the last laugh. He had the trophy. Garcia, when asked if he would have changed anything about the flap with Woods, replied, "It sounds like I was the bad guy here. I was the victim." The real villain was the infamous 17th hole, which knocked out Garcia and Maggert. "When you've got water in front of the green, that's not a good time to be short of the green. You know, it was close," Maggert said. "What can I say? A wrong shot at the wrong time and you get penalized on this golf course." It was at the 17th hole five years ago where Garcia won The Players Championship, when Paul Goydos hit into the water in a sudden-death playoff. This time, the island green got its revenge on him. Garcia hit a wedge and felt he caught it just a little bit thin, which is usually all it takes. "That hole has been good to me for the most part," Garcia said. "Today, it wasn't. That's the way it is. That's the kind of hole it is. You've got to love it for what it is." Woods finished on 13-under 275 and earned $1.71 million, pushing his season total to over $5.8 million in just seven tournaments. This is the 12th season he has won at least four times — that used to be the standard of a great year before he joined the PGA Tour in 1996 — and this was the quickest he has reached four wins in a year. It was the second time Woods has won on Mother's Day. "Sorry, Mom," he said into the camera. "I think she might have had a heart attack. I was in control of the tournament, and I just hit the worst shot I could possibly hit." Typical of Woods these days, there were questions about where he took the drop — some 255 yards from the hole. NBC Sports analyst Johnny Miller suggested it was a "borderline." But Mark Russell, vice president of competition for the PGA Tour, said there was nothing wrong with the drop. Woods conferred with Casey Wittenberg, who said there was "no doubt" that Woods took the drop in the right spot. "He asked me exactly where it crossed," Wittenberg said. "I told him I thought it crossed on the corner of the bunker, right where he took his drop. And it's all good." Woods wound up with a double bogey, and he nearly fell out of the lead on the 15th until he saved par with an 8-foot putt. He followed with another up-and-down from the bunker on the par-5 16th for birdie. Garcia, playing in the final group behind Woods, two-putted the 16th to regain a share of the lead and then walked over to the 17th tee where it ended with two swings. Woods and Garcia played four tension-free holes Sunday morning to complete the third round, and they shook hands without words when they finished — Woods with a 71, Garcia with a 72 to share the 54-hole lead with Lingmerth. With a three-way tie, Garcia wound up in the final group because he was first to play at the start of the third round. Garcia, however, continued to fuel the bad feelings between them. He told Sky Sports, "I'm not going to lie, he's not my favorite guy to play with. He's not the nicest guy on tour." And then he told Golf Channel, "We don't enjoy each other's company. You don't need to be a rocket engineer to figure that out." 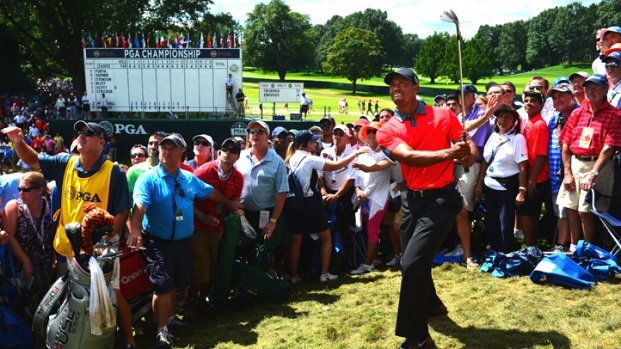 Woods downplayed the episode and said it didn't matter who joined him on the tee. "I'm tied for the lead, so I'm right there." And that's where he usually wins. Woods now is 53-4 in his PGA Tour career when he has at least a share of the lead going into the final round.